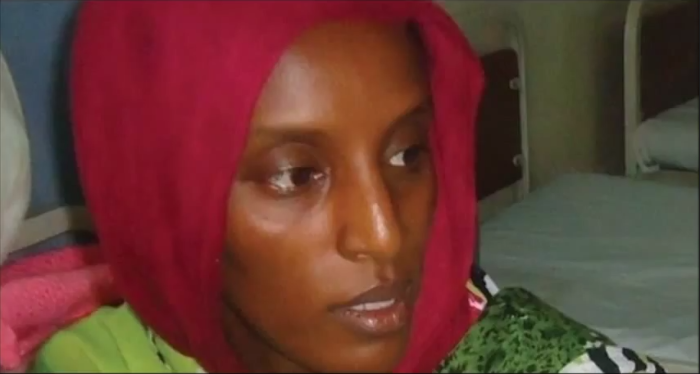 Christian mother Meriam Ibrahim, who was recently released from death row for being a Christian, was banned from leaving Sudan Tuesday after she was charged with fraud for trying to leave the country with documents bearing her Christian name and not the Muslim name she was assigned at birth. According to a MailOnline report, just hours after Ibrahim was relieved of the death sentence hanging over her head, she tried leaving the country Tuesday but was arrested and charged with falsifying travel documents. "It is understood that the authorities told her she should have used the Muslim name she had when she was born, not the Christian name she uses after choosing to worship that faith," noted MailOnline. About 40 members of the Sudanese security police reportedly confronted Meriam's traveling party including their lawyers at the airport in Khartoum Tuesday. In a testy press briefing Tuesday, State Department spokeswoman Marie Harf said Meriam and her family had been detained at the airport in Khartoum for several hours but the State Department was working with Sudanese officials to ensure the family leaves Sudan as quickly as possible. "The State Department has been informed by the Sudanese Government that the family was temporarily detained at the airport for several hours by the government for questioning over issues related to their travel and I think travel documents. They have not been arrested. The government has assured us of their safety," said Harf. "The Embassy has been and will remain highly involved in working with the family and the government. We are engaging directly with Sudanese officials to secure their safe and swift departure from Sudan, and of course, we'll provide more information as we get it," she added. Hardwired, a global social justice movement that mobilizes young leaders around the world to end religious oppression, noted in a Facebook post on Tuesday, however, that Meriam was only released Tuesday after a friend posted her bail and that individual will be penalized if she leaves the country before the charges are settled. "She has since been released but only after someone posted bail. New charges against her and if she leaves the country the person who paid bail will be charged. New charges have to do with falsifying documents," noted Hardwired. The organization's founder, Tina Ramirez, also called on Congress to investigate the way in which Meriam Ibrahim's case was handled by the State Department. She argues that the painful fiasco could have been avoided if U.S. embassy officials in Sudan had given Meriam's U.S. citizen husband Daniel Wani the help he requested when he approached them with the case last September. "The US government should have coordinated with the government of Sudan to get them out of the country. This is sloppy. They have had three years to sort this out and whenever Daniel has gone to the U.S. embassy in Sudan for help they have refused," said Ramirez. "I think that Congress should be investigating what happened here. The US says that it cares about human rights issues and this is something they should be caring about. It's a total failure, it's shameful," she added. Meriam Ibrahim, 27, was first released from prison on Monday after an appeal court annulled the death sentence she received for apostasy. In February she was first arrested while still pregnant with her second child. She gave birth to a daughter while in chains in prison about a month ago. She and her husband named the daughter Maya. They also have a 21- month-old son named Martin. The defiant Christian woman who refused to renounce her faith even in the face of death was born to a Muslim father but in 2011 she got married to Daniel Wani, a Christian who is also a naturalized U.S. citizen. Although she was raised by her mother as an Orthodox Christian, the authorities in Sudan considered Meriam Ibrahim to be a Muslim because that is the religion of her father.